The AGA is in the house!!! We have waited for 12 weeks to get it and we thought we would be nearly finished before it arrived. Obviously we are still a long way from finishing the house but the centre-piece of the kitchen is in place. We also had to get the plasterers in early to plaster the wall behind the AGA. They did an amazing job and now the "Beehive" oven and the wall look fantastic. I was not there for the plastering but Daniel supervised and sent a few pictures as they did the work. Brian had done some terrible 'blocking' in the kitchen, for the kitchen shelves. 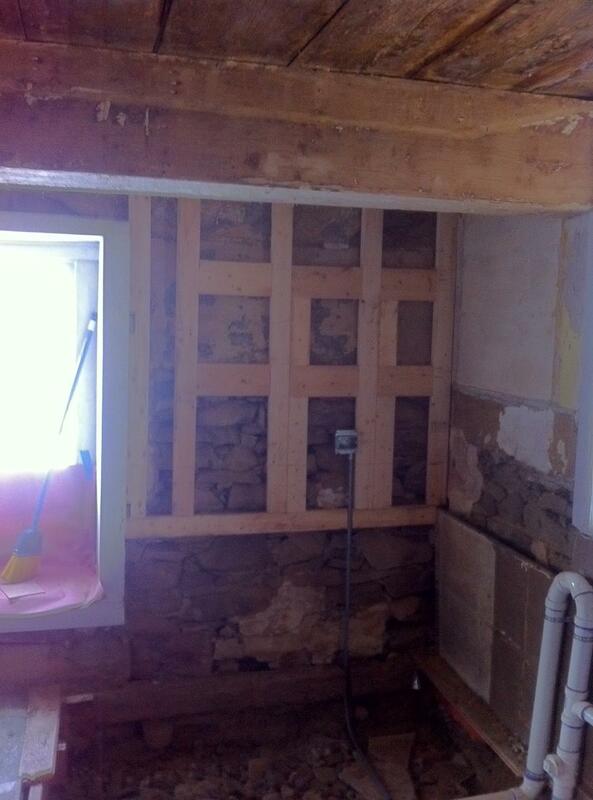 He had initially stuck a plywood board on top of the old plaster which had no chance of holding a shelf. 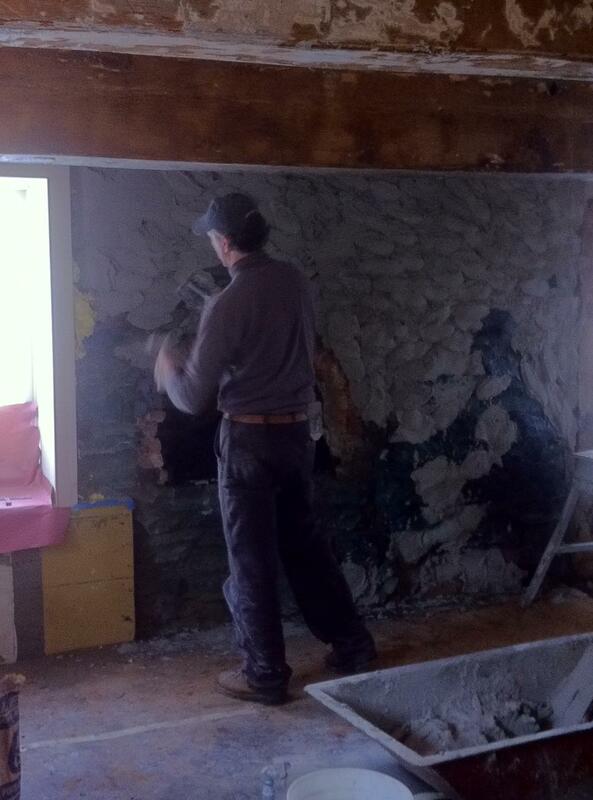 We had to make him do it again, this time taking the old plaster off and building some real, solid furring. 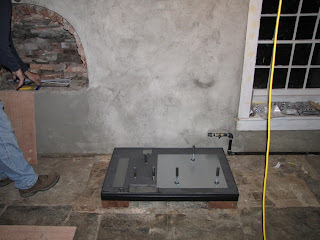 Second time he did a decent job and then our plasterers (The Manchione brothers) set to work. 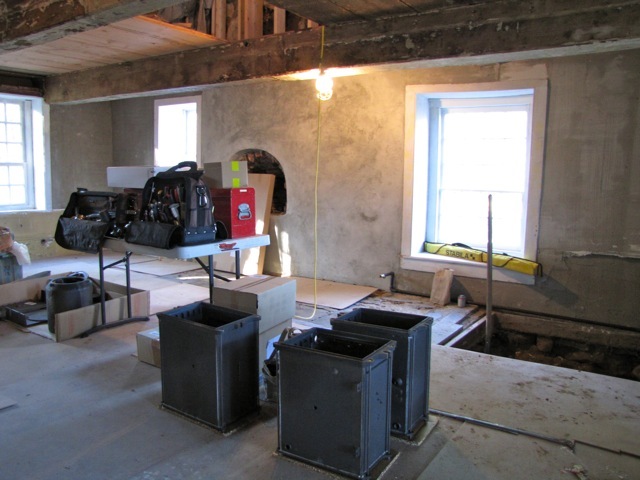 The plastering started with big "gloops" of plaster which were thrown on the wall very quicky. Then lots of smoothing and contouring to keep the sense of the stone wall but evening it out. We ended with a wonderful 'bow' to this wall where the old chimney had been and overall it looks fantastic. Conveniently, the bow in the wall also allows the electrician to pass wires behind the AGA and gives us a little space to get to the gas valve shut off which is also located behind the AGA. The process of building and AGA took two days. 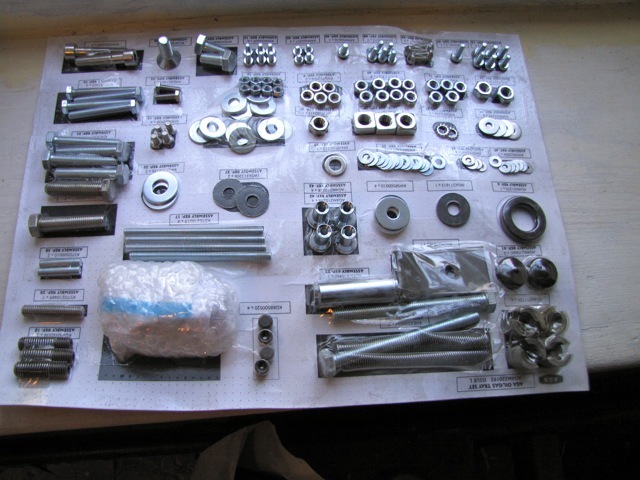 The unit is shipped in pieces and is assembled on site. When everything was set out in the kitchen it looked like something from NASA. 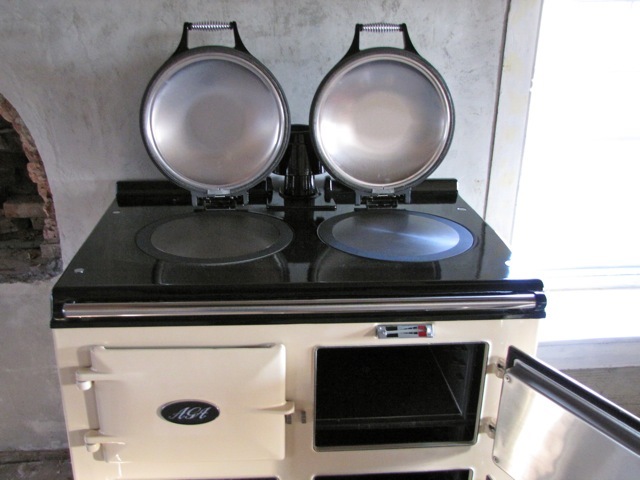 Basically, an AGA is a number of very heavy cast iron ovens connected to a furnace. The important thing is to make sure the base is set exactly where you want it - perfectly level and perfectly located. 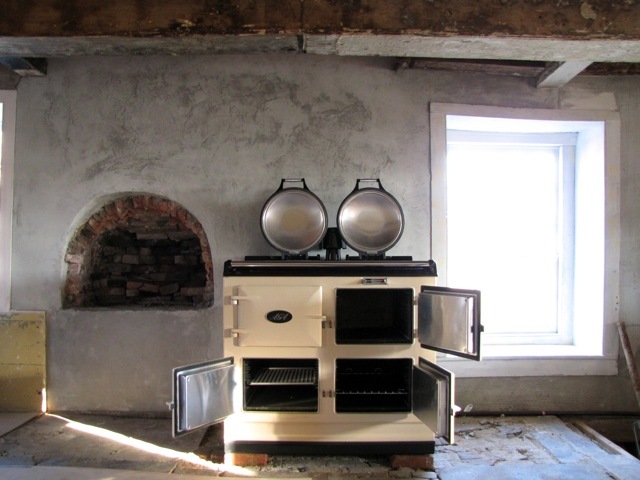 The AGA weighs 1000lb (half a ton) and so once it is set in place it's not really moving anywhere. The challenge for us was that nothing in our kitchen is level or true. 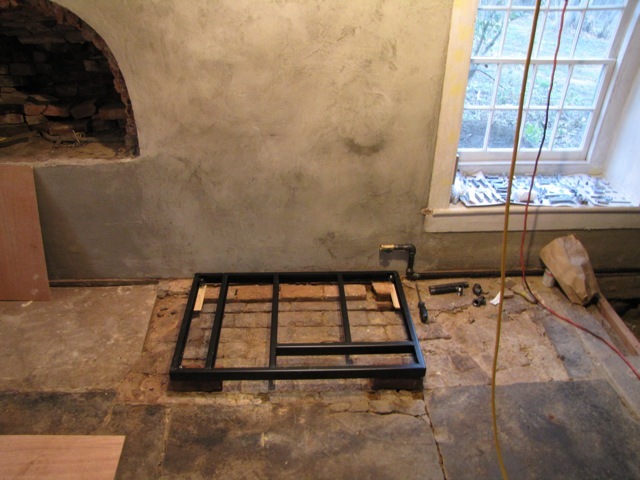 The wall is not in line with the beams which are not in line with the hearth. 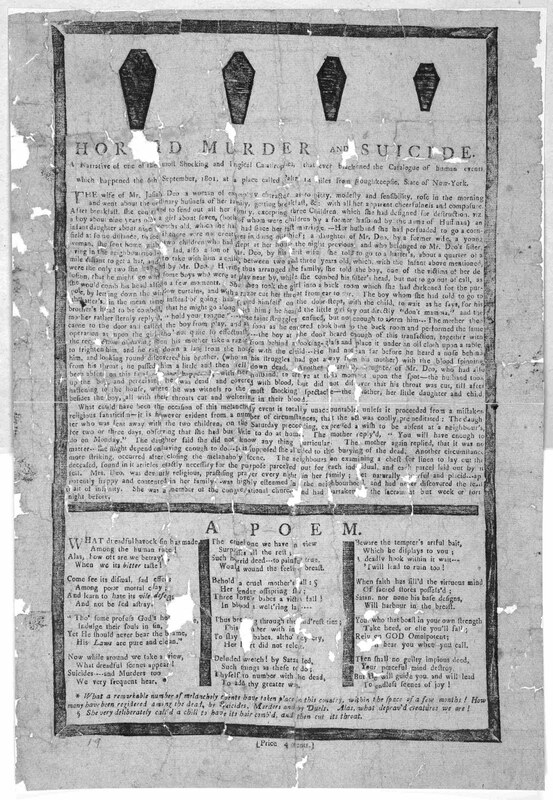 We eventually decided we would set it in line with the overhead beam and the partially true to hearth...The wall behind would just have to be at an angle. 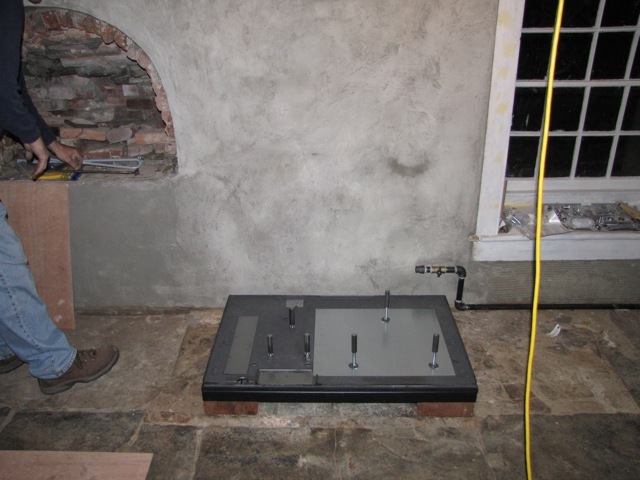 Once the base is assembled and set level, a cast iron base is attached and hexagonal steel rods are put in place to hold the cast iron ovens. Just this bit took the best part of the day and although I was not there to see the second half of the assembly, John Bingham - the AGA installer, took me through the parts and pieces and explained how they would be assembled. 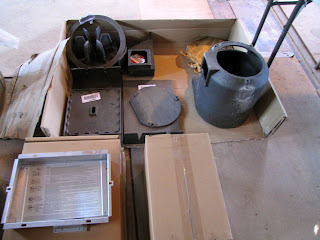 Basically the AGA is a gas furnace set inside the cast iron "belly" - the round thing seen on the right of the picture. 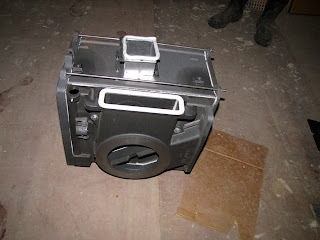 The hot air is fed out of the square hole, on the left of the 'belly', into the cast iron roasting oven. In the top of the furnace goes the cast iron 'fins' that heat the hot plate to 700 degrees. 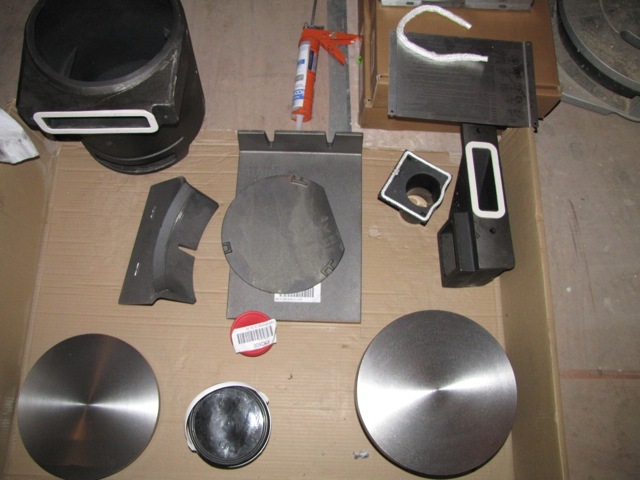 The hot 'ring' of the oven stays at this temperature because these fins (seen in the top left) extend into the heart of the furnace and transmit heat to the 'boiling' plate. That's why an AGA can boil water in seconds! 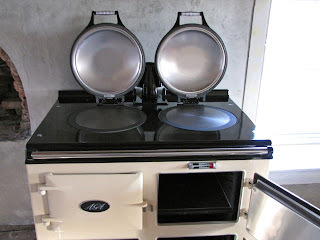 The two steel hot plates, one boiling and one simmering, looked fantastic. These are the two plates that all the surface cooking is done on. The main oven, i think. After the hot air goes to the main oven it is passed to the other, cooler ovens. The roasting oven is kept at 450 degrees, the baking oven at 325-350 degrees and the warming oven kept at a slow cooking 200 degrees. All of the ovens are solid cast iron and once they get up to heat they don't take much energy to stay at that temperature. 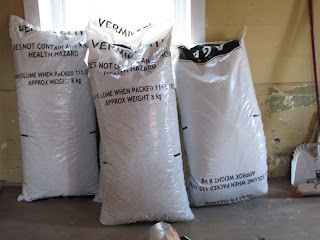 One of the reasons for this is the insulation. After the AGA is assembled, all the empty space in the stove body is filled vermiculite insulation. 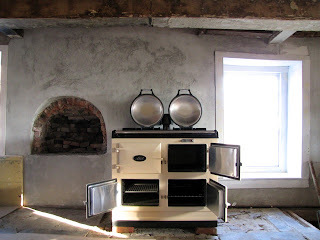 It took three bags of insulation to surrounded all three ovens and filled the body of the stove up to the hot plates. There was not one aspect of the assembly of the AGA that was not aesthetically pleasing. Everything smacked of quality, which you would expect for the Bentley of cooking stoves, but it was a real delight to see where the money went. 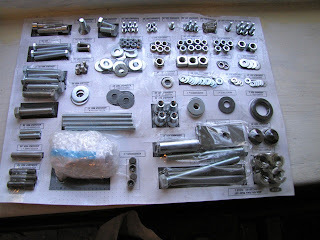 Even the bolts, washers and screws were presented in a beautiful way. 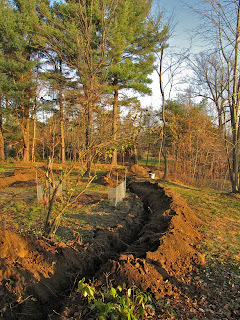 So, imagine my distress when I get a call in the morning from Brian telling me that we do not have anyone to excavate the gas line. 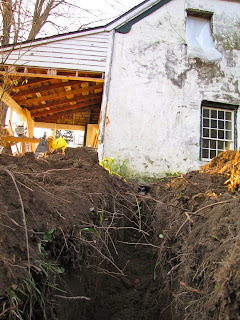 We had Kimlin ready to install the pipes and the 100 gallon propane tank but the excavation, that Brian had organized, was not there. He said the excavators trailor had broken down and they could not get the equipment to the house. Personally, I'd have found another trailor - almost everyone in Ulster County seems to have one. So, true to form, we had to wait. 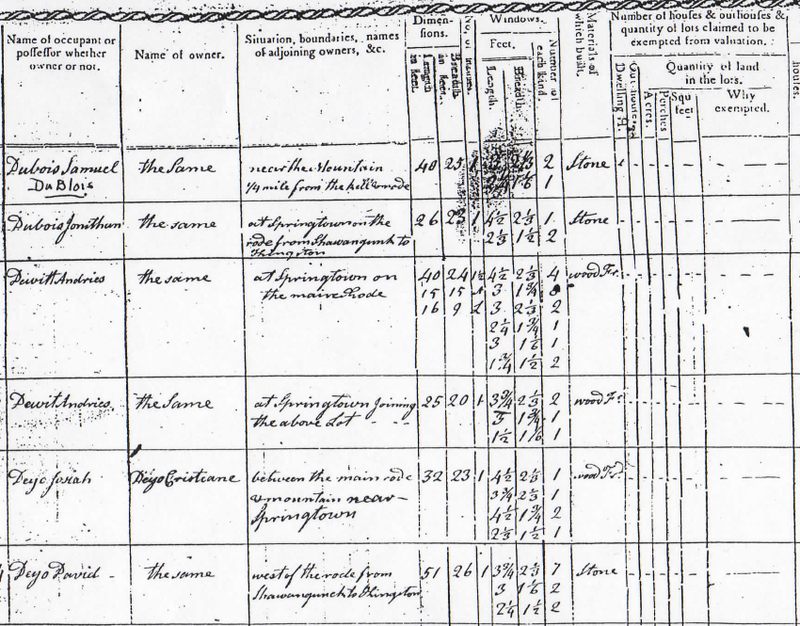 The AGA was there but the trenches could not be dug. In fact, Brian didn't even turn up. 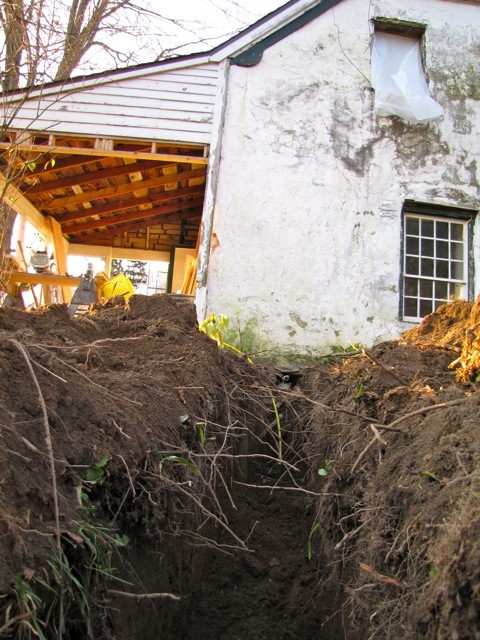 Daniel had to dig the holes for Jason the plumber to put in the gas pipe through the wall, below grade. Another day, another delay. UPDATE: The trenches have been dug. Kimlin are coming on Tuesday to put in the gas and the flu is being built on Thursday...So the AGA will be up and running in a week.